P22 CoDependent, designed by Terry Wudenbachs for IHOF, is a revival of the Independant typeface from 1930 created by Dutch designer Johannes Nicolaas Coenraad Collette along with Jos Dufour from Belgium. 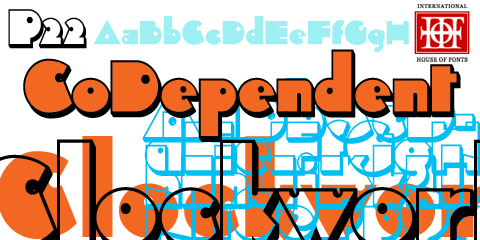 Independant was released in metal by the Belgian division of the Amsterdam Type Foundry in commemoration of the 100th anniversary of the independence of Belgium from the Netherlands. Despite the name, the two fonts contained in the set, Regular and Shadow, are not codependent upon each other. They can be used alone, but together they can create a dynamic two-color option. There have been other fonts inspired by and revived directly from Independant, but this version adheres the original design with the added consideration of how the shadow version will overlap. P22 CoDependent is Perfect for a wide array of design uses. Click here for more information, previews and pricing for the P22 CoDependent Set. Special Introductory Offer- The P22 CoDependent Set is free with any $50 font purchase placed on the P22 website through May 1, 2012 only.